We come across another lament of an afflicted man in Psalm 102. Deep and pressing sorrow fills his complaints. Can you relate to his cries? Are your days passing like smoke? Are your bones on fire? Is your heart filled with canker and blight? Do all your prayers begin with begging Him to just hear you over and over because you doubt He’s really listening? 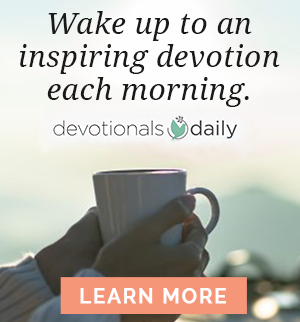 If He were, God would surely do something, but all you have to sustain you is dry ashes and bitter tears. Life used to be better, not perfect, but better than this! You don’t understand what’s happened. How did you get here? It’s as if God has, after walking before you and leading you, just lifted you up and thrown you aside. Your whole life is lived in the shadow of evening and you can’t escape. You’re blocked in all around. Adding insult to injury, Psalms 100 and 101 just encouraged you to shout for joy, to worship the Lord with gladness, to sing of His love and justice, to be careful, and to live a blameless life! You’re trying, but this cloud of darkness has settled in around you. You can’t see where you’ve gone wrong and you can’t see your way out, let alone to your way to God. How are you supposed to come before the Lord with joyful songs if you can’t see Him? In the book of John, chapter 10, we read about many different flocks of sheep being gathered into a single pen for the night. The sheep have different shepherds and they get hopelessly mixed together during the night. The only way to the highlands is through the valley of testing and trial. Jesus is our Good Shepherd and He gives us careful scrutiny, using His rod to separate the wool from the skin. He checks for health and quality, and searches for thistles and burrs. His rod is for correction and His staff is for guidance. 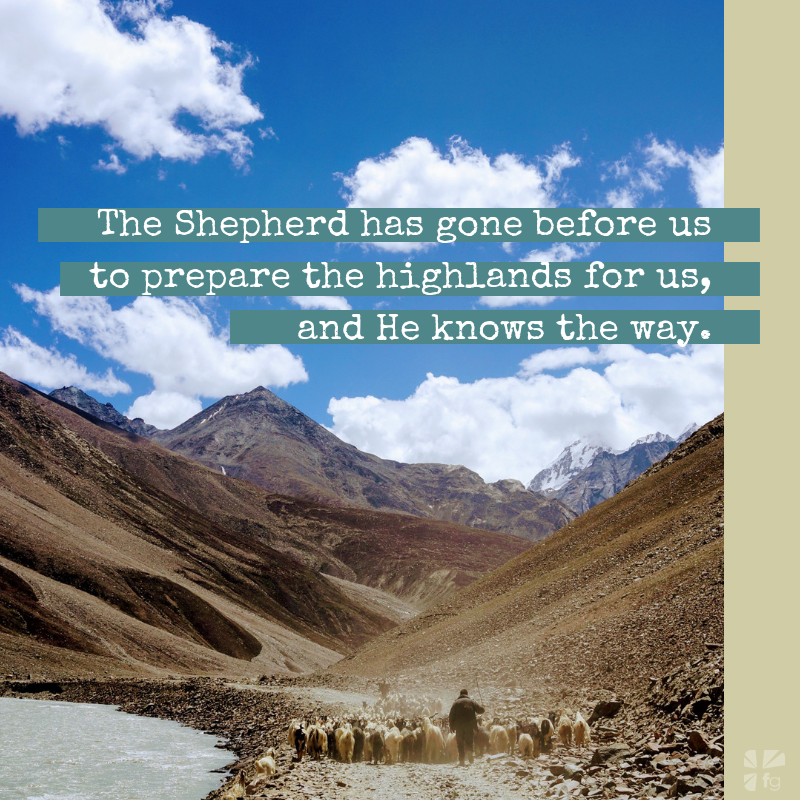 The Shepherd has gone before us to prepare the highlands for us, and He knows the way. He has assured us we can make it. He has counted the sheep of His flock carefully; not one will be lost in the mix. The Shepherd will come in the morning, preaching a message His sheep will follow, for they recognize His voice. You remember that the Lord is God. It is He who made you, and you are His. You are not lost in the mix, but a sheep of His benevolent, green pasture. When you can’t see Him through the darkness, perk your ears to hear the warmth of His voice. Your night may be filled with weeping, but joy will come in the morning. Lord, my days are like the evening shadow; I wither away like grass But you, O Lord, sit enthroned forever You will arise and have compassion on me, for it is time to show me favor You will respond to my bleating prayers and not leave me destitute You will come for me in the morning and rebuild. If the Lord has fenced you in for the night, be assured He will come for you in the morning. Your journey is far from over. One bright, sunny day, you will enter His gates with thanksgiving and His courts with praise. 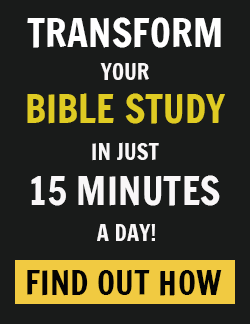 Excerpted by permission from 10 Minutes in the Word: Psalms, copyright Zondervan. Are your bones on fire? Are you suffering and wondering if Jesus is even paying any attention? It is dark, but morning is coming. And along with the daybreak, comes joy. Share your comments with us on our blog. We want to hear from you!